In large bowl, beat shortening with electric mixer on medium speed 30 seconds. Gradually add sugar, about 1/3 cup at a time, beating well after each addition and scraping bowl occasionally. Beat 2 minutes longer. Add egg whites, one at a time, beating well after each addition. Beat in vanilla. On low speed, alternately add flour mixture, about one-third at a time, and milk, about half at a time, beating just until blended. Bake 18 to 20 minutes or until toothpick inserted in center comes out clean. Cool 5 minutes. 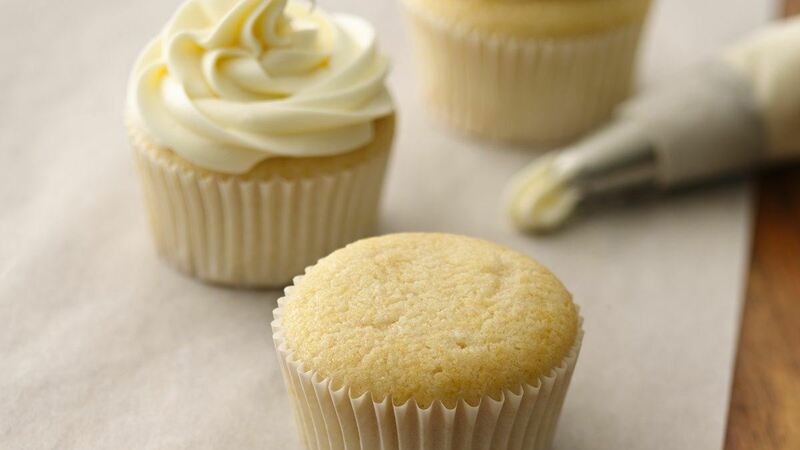 Remove cupcakes from pans; place on cooling racks. Cool completely, about 30 minutes. Frost with desired frosting.